After launching UVK, the Home section will be displayed, like the picture below. Note that you can launch UVK by pressing the following set of keys: Ctrl + Alt + U. The UVK's Home section, also known as Main menu is the user interface normally displayed when you launch the application. It consists of a window containing 24 buttons. Each one of these buttons will take you to the corresponding UVK section, or module. The section you're taken to will have a return button, usually named Home, which will bring you back to the starting point again. This simple procedure allows you to navigate through all the UVK's features without the need of a permanent side/top bar having all the buttons, which would constantly use a large ammount of precious space in the GUI. The five small buttons at the top will jump to application related features. The six buttons in the left bottom area of the window refer to system repair and optimization features. 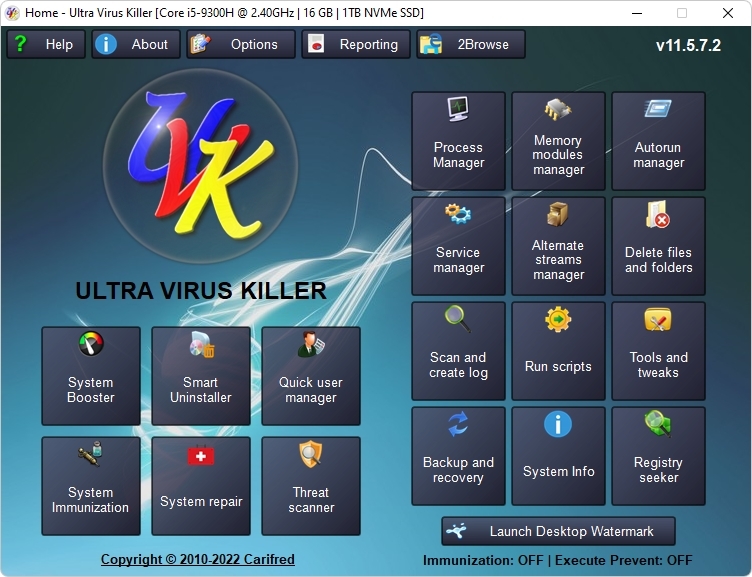 The twelve buttons in the right side refer to malware removal and system information features. Below is the list of actions you can perform after clicking the corresponding button in the welcome screen. Improve system performance and reduce registry size by removing invalid registry keys and values. Improve the Windows shell's responsiveness by removing invalid shortcuts. Free up hard disk space by removing unnecessary (junk) files and old restore points. Export the list of items found to a text file. Create system restore points and register the system files. Cleanup all temporary files and browsers cache. Add custom uninstall entries to the uninstall list. Open the file system location of the program's folder or the uninstaller file. Manage all user accounts in your system, including buil-in accounts. Easily add new user accounts, and simmultaneously set their password, privilege level and associated picture. Remove user accounts in two clicks. Change or remove the password for any user account. Change the picture associated with any user account. Hide a user account from the welcome screen. Enable, disable user accounts and much more. Prevent executing files in specific directories. Repair your computer with more than fifty exclusive fixes: Register system dlls, enable and repair Windows update, clear dns cache and the hosts file, reset user default registry settings, fix installation problems, empty all browsers cache, reset security settings, defragment and optimize the hard drives, install Java, Flash, DirectX, .Net Framework, Fix the WMI and the system restore, delete all restore points, fix the windows shell, reset the user shell folders and much more. Automate the most popular malware removal tools: MalwareBytes AntiMalware, Super AntiSpyware, Rogue Killer, Kaspersky TDSSKiller, Avast! aswMBR, AdwCleaner, Junkware Removal Tool and Avast! Browser Cleanup . Create your own apps, which can automatically download and run files. Create professional html reports of all the actions performed in this section. Import/Export everything to a file, allowing you to run the desired fixes and apps with a couple of clicks. Detect and remove adware for all the users in your system in less than two minutes. Detect and remove browser toolbars, ad-ons, plugins, unwanted search providers and hijacked home pages, and also potentially unwanted programs (PUP's). Reset Chrome and Firefox's preferences. Kill several processes using special filters. Delete the whole parent directory of a process. Get the VirusTotal report of the running files. Open the running files location. View the running files properties. Manage the services running in a specific process. List all loaded memory modules. Search information about the memory modules over the internet. Verify the memory modules files signatures. Filter the modules list. You can hide system protected files, all Microsoft files, or all digitally signed files. Get the VirusTotal report of the memory modules. Open the memory modules file locations. View the memory modules file properties. Delete infected memory objects using two diferent methods. Delete autorun entries, scheduled tasks and the corresponding files simultaneously. Select and manage several autorun entries at once. Verify the autorun entries file signatures. Filter the autoruns list. You can hide system protected files, all Microsoft files, or all digitally signed files. Search information about a autorun entry file over the internet. Get the VirusTotal report of the autorun files. Jump to the registry key where the autorun entry is located. Open the autorun entries file locations. View the autorun entries file properties. Filter the services list. You can hide system protected files, all Microsoft files, or all digitally signed files. Verify the services/drivers file signatures. Get the VirusTotal report of the service/driver file. Jump to the service's process in the Process manager. Recursively scan a drive or folder for alternate data streams. Search information about the streams over the internet. Verify the ADS files signatures. Get the MD5 VirusTotal report of the streams. Open the streams file locations. Delete one, several or all the streams found. Delete files and folders you can't normally delete from the Windows explorer. Delete the files permanently or move them to the recycle bin. Perform other custom scans, such as retrieving specific information on files, folders, registry entries, or automatically get the VirusTotal analysis result for a file. Use custom commands to download files, execute programs, delete or add registry entries, terminate processes, delete files and folders, run cmd batch scripts, register system files, run the UVK Fixes and much more. Create and run scripts that perform complete system repair, maintenance and optimization. Run useful Windows or third party tools such as the registry editor, msconfig, the decice manager, the windows console, the task manager, Blue screen viewer, Windows installer cleanup tool, .NET framework cleanup tool and much more, all in one click. Quickly enable/disable Windows features such as the administrator account, the user account control, the system restore, the hibernation, view hidden files and much more. Repair the file associations that are most commonly corrupted by malware: exe, com, msi, bat, cmd, reg and vbs. Prevent those file associations from being infected/corrupted. Open a file or internet location. Generate VirusTotal reports, deny or grant access, or perform an sfc scan for any file. Show information that can be very useful specially if you're going to reinstall windows or if you need to diagnose a performance or hardware problem. This includes the processor, memory and page file usage, OS and office product keys, and hardware, software and user accounts info. Scan the registry for several text strings simultaneously. Display the matched keys and values for eact string in a separate group. Securely remove the selected keys/values by performing a backup before removal. Forced removal of the selected keys/values. Cancel check the system drive or reset the user default settings on reboot. Run the Log analyzer, check for updates, report a bug or send a comment. Customize the UVK's interface by choosing one from 11 available skins. Send the application reports to your email address. Send the application reports to your FTP server. Choose which files to embed in the report. Clicking the Help button or pressing F1 will bring you to this page. Clicking the About button will display a dialog box showing information about the current UVK version and the product activation, as well as options to purchase and install a UVK license.